Fig. 25. Centaury small (inflorescence). 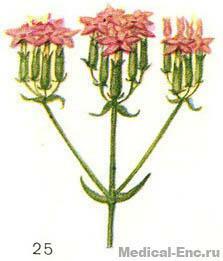 Centaury small, centaury (Centaurium minus Moench) is a wild plant. Contains glycosides. Extract (10 : 200, 1 tablespoon before meals) and tincture of grass (on 15-20 drops) is used as bitterness for the initiation of appetite and enhance the function of organs of digestion. Part bitter gastric fees and bitter tinctures.